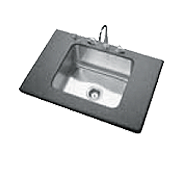 Single bowl stainless steel classroom sinks from Just Manufacturing are available in 6 ledge type variation configurations as well as wall-hung and cabinet top mount stainless steel sink models. 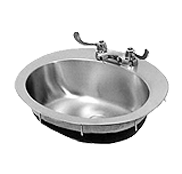 With over 150 standard and ADA models in our catalog, Just Manufacturing is the leader in school stainless steel sinks and plumbing fixtures, including laboratory sinks. Our product line of classroom stainless steel sinks and faucets and bubblers offer the only 100% stainless steel sink package available in the marketplace and our Integra-Flow overflow, vandal-resistant faucet and bubbler ledges are an industry first. Learn more about the benefits of vandal-resistant plumbing fixtures from this case study. 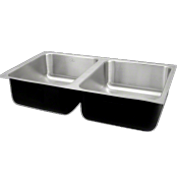 All Just Manufacturing single bowl stainless steel classroom sinks and other fixtures are Made in USA and certified for ARRA project work specifications. Our comprehensive product catalog offers fixtures for a large variety of applications including academic, residential, institutional, medical and commercial! 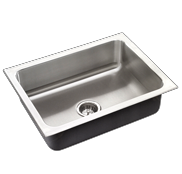 Our commercial grade sinks made out of stainless steel exemplify our ongoing commitment to product development. 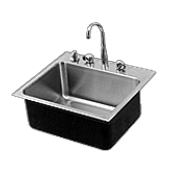 Our product line of sinks, faucets and bubblers offer the only 100% stainless steel sink package available in the marketplace and our Integra-Flow overflow, vandal-resistant faucet and bubbler ledges are an industry first. 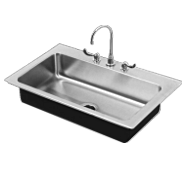 Check out the rest of our residential and commercial grade stainless steel products and commercial plumbing fixtures that offer flexible spec solutions, and the broadest product offering in the plumbing fixtures industry. Just is the clear choice for quality products and durability for the classroom that will last for many years in those heavy use environments!